Canadian lifestyle and travel magazine. Contents include: Snowbirds head south - part 2. Discover the towns an cities to visit en-route to Florida, review of the Amazon Kindle, Could a cure for multiple sclerosis be just around the corner? 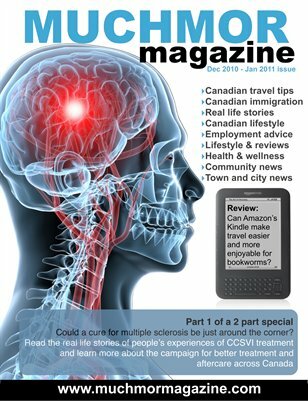 Real life stories from MS suffers who have had or are awaiting treatment for CCVSI or liberation therapy as it is known. Housing prices across Canada, a personal approach to insuring your mortgage, texting whilst driving, safest drivers in Canada, 2011 Canadian Car of the Year Awards, workplace bullying, average earnings across Canada, freelance friendly jobs, Toronto's colourful neighbourhoods, Hastings County, winter wonderland in Greater Sudbury, 2011 immigration plans, investor program update, autumn in Nova Scotia, Real life story: From Sri Lanka to Smiths Falls.